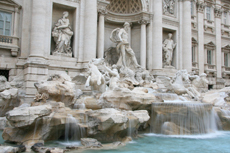 The famous Trevi Fountain was built by architect Nicola Salvi and is one of the largest fountains in Rome. Beautiful and the sculpture was so detailed. beautiful!!! Very crowded - watch your belongings! Lots of walking. Had the time to take lots of pictures. Wish we had more than 5 hours in Rome for first visit. Not as I imagined it. Not as I imagined it. Had to go down lots of little back streets. Thought it would open up into a large square but the fountain seemed to be tucked away. Threw 3 coins in the fountain from up top. Threw 3 coins in the fountain from up top. Too crowded to get close to the Fountain. Wished to return to Rome when there are no crowds. Watch out for pick-pockets.. Over-crowded most of the time. The constant whistle-blowing from the guards supervising the thronging masses is irritating. Very crowded but lovely to see and able to throw our coins in the water. Massive crowd but still able to enjoy the beauty of the fountain. Massive crowd but still able to enjoy the beauty of the fountain. Getting a gelato proved to be the highlight of the tour. Another great place to people-watch and soak up some of the city life. Another great place to people-watch and soak up some of the city life. Also enjoyed lunch in a small outdoor cafe on a side street off of the Piazza Navona. Beautiful to see but very crowded. Beautiful to see but very crowded. It was hard to get a good shot of the fountains because there were so many people. Still worth getting close to such a beautiful fountain. Fountain in all its glory. Fountain in all its glory. Made up for the 2 previous visits where the fountain was under scaffolding and rennovations. Very crowded. Battled to get good photos, so many tourists. Awesome Gelato shop at the Fountain. Actually had time to take some nice pics, and a little free time to explore but still rushed. The general tour of Rome too much, too fast. The general tour of Rome too much, too fast. Our tour guide walked very briskly and many times left older members of the group behind. We did get to see the Trevi Fountain, but only for a few minutes while we tried to grab some lunch. The Trevi fountain is very pretty now it has been cleaned but the area is very busy! It was expensive, but worth it. After the Colloseum we had a pizza in a restaurant and walked to the Trevi Fountain, it was easy enough to find. It was very, very busy, brilliant to see, just beware of pick pockets here as its so busy! Our driver Marco was the best guide we had the whole cruise and we had a guide in every port. We parked a half a block away and walked to the Baroque fountain of Hollywood fame. We parked a half a block away and walked to the Baroque fountain of Hollywood fame. I threw the obligatory coin into the fountain and am now guaranteed a return to Rome! I only hope it doesn&apos;t take long to go back.